2015 was once again a year where a lot happened. My year began with the start of a new job – I am now employed as a full time developer at the Swiss Shareholder register ShareCommService AG. The first days in Switzerland where full of trouble, as I needed to start from scratch in a new country. I found a room in a shared appartment, which was quite ok for me alone. Internet, phone, insurance, pass port – these were the things I had to do in the first weeks besides learning all the new things that you usually do when entering a new company. As part of my new job, it was also heavily demanded that I finally get deeply into MVVM. I always read a lot about that, but avoided it because I wanted to get things done in my private projects. 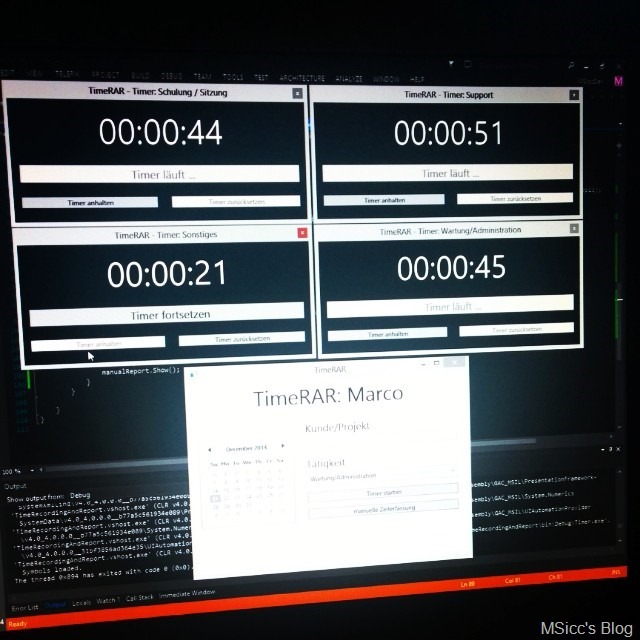 My MVVM learning project was a WPF timer app that supports resuming, multiple timers and more. I learned it in the only right way: without any frameworks/toolkits, which helps a lot to understand what is going on. Needless to say that I am happy to be past this point, as we are using MVVM Light a lot in our LOB applications. LOB (Line-of-Business) applications are different from what I have done before. They are used only internally and directly affect our daily business. I also learned more about SQL and databases, and also SignalR took a big part of my learning curve. I have the luck to learn from Roman Müller, who has a gigantic amount of experience in programming and also has always some funny programming story to tell from his past. Together with Reto, the second programmer in our team, he teached me a lot – not only programming things, but also better ways to analyze and think about situations where you can end in programming. I am really thankful to be part of this team. Our system administrator Stefan, which I like to refer as a ‘BOFH with the heart on the right place’, makes the team complete. During the year, I participated also in several Annual General Meetings (AGM) of our customers. This was very helpful for me to understand my new job, as we are responsible for all things regarding the votings on their agenda. 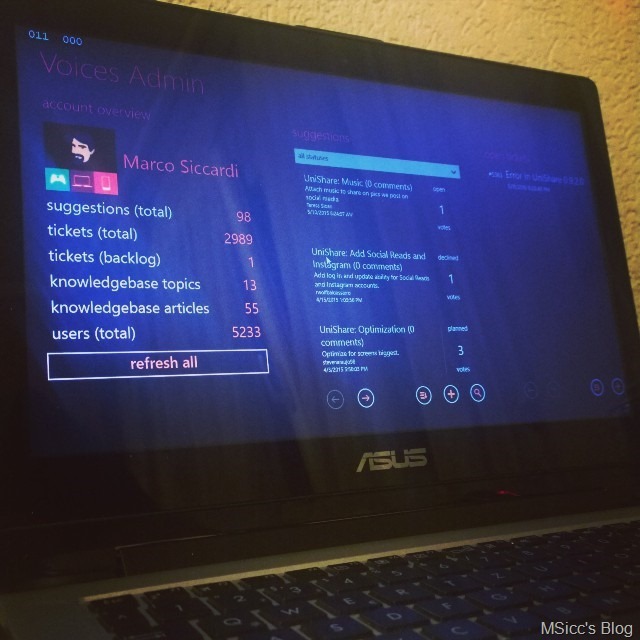 My first private project this year was to rewrite Voices Admin as a universal (Windows 8.1) app. Of course I did it as plain MVVM app, and it helped me a lot to get even deeper into it, and also boosted my learning curve in my daily job. I updated my UserVoice library as well to be fully portable in the meantime. Currently, I am working on the UWP version of UniShare. My family stayed in Germany for several private reasons in the first month of the year. Beginning in August, we moved completely to Switzerland. I am happy that we passed this point as my family is very important to me and is giving me a lot of power. I have to thank my wife and also both of my kids for their understanding, as being a programmer is often very time consuming. I also discovered a completely new area: the Internet of Things. 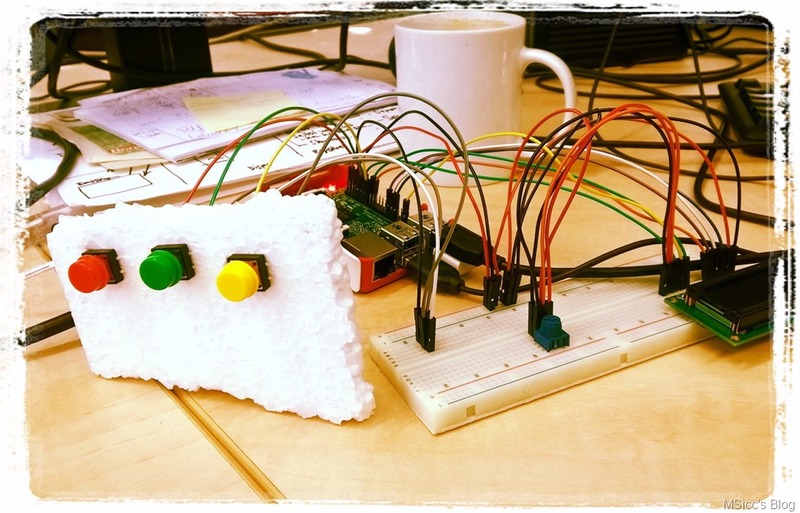 With the Rasperry Pi2 supporting the Windows 10 IoT Core, I played around with it, learned a few new things about building hardware – and build a prototype for internal testings. You see, I had a year full of action, and I tried to make this post as short as possible. I am looking forward to 2016, where my developer story will continue. I did also blog only a few things this year, and I am trying to keep things up and post more frequently next year. For now, I whish everyone all the best for the end of this year and also for 2016!